"Still one of the very best DACs you can buy -- still a Reviewers' Choice"
I had my first encounter with the Zanden Audio Model 5000 in 2002 when I reviewed the DAC in its Mk II iteration. It was a product I considered state of the art and figured Zanden would be hard-pressed to make better. But Mr. Yamada, owner of Zanden Audio and the designer of all of his companys products, made some changes and the Mk III was born. Marc Mickelson re-reviewed that DAC, and although he was not able to compare it to the Mk II version (he didnt have one on hand), he did compare it to some heady competition and declared the Mk III state of the art, just as I had for the Mk II. After that, both Marc and I thought that Zanden had taken the Model 5000 about as far as it could go. But then in late 2003, Mr. Yamada let me know he had made further improvements. He told me that I had to hear the latest version, so after a trip "Halfway Around the World, and Then Some," the Model 5000 Mk II that I used in 2002 was upgraded to Mk IV status and returned to my house for re-re-review. The details of the Model 5000 have been explained in both Marcs and my reviews, but its worth repeating a couple of things here. First, the Model 5000 uses a tube output stage with a single 6922 and tube-rectified power supply with two 6CA4s and one 6X4. Second, the DAC -- whether Mk I, II, III or IV -- doesnt upsample or oversample, the digital darlings of the day. Instead, Zanden uses a proprietary analog filter designed and patented by Mr. Yamada. This filter, Zanden contends, is one of the crucial ingredients of the units especially fine sound. At $9800, the Model 5000 Mk IV costs more than many peoples entire systems -- and it decodes only CDs. By virtue of its price, its not designed for everyone. In fact, its destined for hardly anyone. The Model 5000 Mk IV is for listeners who want the best CD sound attainable -- and can afford it. 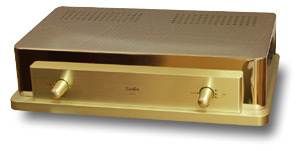 Physically, the Model 5000 Mk II, Mk III and Mk IV are identical -- the same mirrored chassis and number of analog outputs (a single-ended pair) and digital inputs (AES/EBU, BNC, and two RCA). Not even the model designation on the chassis has changed. All upgrading goes on inside. According to Mr. Yamada, the Mk IV uses more effective RF shielding and absorption material to better deal with "digital noise." Some parts have also been changed and others added to improve the DAC's tonality and transparency. The upgrade cost for a Mk II DAC is $600 and for a Mk III $300. The Model 5000 Mk II that left and came back a Mk IV arrived with the same overall sonic signature it had before. Nothing had changed drastically. Frequency extension up and down remained the same, the smoothness that I liked so much about the Mk II was intact, and the overall character of the DAC remained spot-on pleasing and never fatiguing. This is all very good news. Its not useful to say the Model 5000 Mk IV sounds good or even great -- such words mean little because they are used to death in audio reviews. Besides, there are some CD players, and even some DVD players, that cost as little as a few hundred dollars that are pretty significant. Its what's special about the Model 5000 Mk IV that matters most and helps explain just why someone would invest in a DAC of its caliber. One of the things that makes the Model 5000 Mk IV -- and the Mk II, too -- so noteworthy is smack in the middle, the midrange. And theres no better test of midrange prowess than the human voice. Even a novice listener can tell you in a snap if a voice sounds realistic. With voices Ive heard, nothing -- other CD-based sources, other advanced-resolution digital formats, even LPs -- sounds as good as the Model 5000 Mk II and now the Mk IV -- except for an actual voice, that is. And you dont need to pull out some boring-but-well-recorded CD from an audiophile label to hear what Im talking about. I turned to indie queen Ani DiFranco and "Everest" from Up Up Up Up Up Up [Righteous Babe RBR013] and lately her "Wishin and Hopin" from the soundtrack to My Best Friends Wedding [Sony 68166]. What it is exactly that DiFranco's doing in the recording studio I dont know, but I do know that she knows how to record her own voice. On my system and through the Model 5000 Mk II or IV DACs, she sounds glorious. "Everest" is quite telling because of the many subtle details the song contains. For example, every good digital source Ive heard gets the tonal balance and positioning in the stage right. DiFranco is left of center and somewhat back of the speaker plane. You dont need to spend ten grand to get that. Where the very best DACs excel over the rest of the crowd is in the exact placement -- left to right and front to back -- and the isolation of the voice in space. The Model 5000 Mk II and Mk IV are in this camp. DiFranco is slightly inside the left speaker and about three feet back. What starts to set the Model 5000 Mk II and Mk IV apart even more are the liquidity and purity that make DiFranco's voice sound so enticing and real, which gets to the heart of why some vinyl lovers eschew digital (but only if they havent heard any version of the Zanden Model 5000). Many lower-priced digital sources exhibit a brittle quality thats been dubbed "digititis." I hear it, too. And surprisingly, some very expensive DACs and players exhibit this malady. The Model 5000 Mk II and Mk IV have none of that whatsoever. Any version Model 5000 is the digital source that vinyl lovers dream of for its smoothness and lack of digital nastiness. What puts the Model 5000 Mk II and Mk IV past much of the competition, though, goes beyond midrange performance and smoothness. There is an uncanny immediacy and transparency that allow me to hear every inflection and detail on CDs. In my original review, I used the word "immediacy," and while that still applies to the Mk II as strongly today, it's more apparent with the Mk IV. This is where the differences between the II and IV start to take shape.
" theres precision and effortlessness to the Model 5000 Mk IV's presentation, just as with the Mk II's, but theres a touch more detail as well, and it makes the subtle stuff come to life a little more and helps to give the Mk IV even more presence and immediacy. As well, that "isolation" of the voice in space is just a touch more stark. Not surprisingly, soundstage width and particularly depth -- both of which are at least partly dependent on a source's ability to capture such detail -- are improved. With the Mk IV theres more -- more space in the stage, more air around performers, and more delineation of instruments and singers. While I think the Mk II is a superb DAC, when push comes to shove I could criticize it for a slight lack of ultimate resolution -- in other words, the ability to unveil everything on a CD. Other topflight digital sources edge it out in that department -- the fabulous Weiss Medea comes to mind (at $13,500). The Mk IV narrows any gap and still presents music in a completely enjoyable way. In a nutshell, to my ears Mr. Yamada made the sound of the Mk IV a little quieter, allowing more music to emerge. There's ever-so-slightly greater detail. The difference is certainly not staggering, but for someone who is seeking the best sound regardless of price, its relevant enough to take seriously. If you want to hear what state-of-the-art CD playback sounds like, even as DVD-A and SACD are poised to replace the format (but have not succeeded) and enjoy your CD collection now as well as for years to come, one of the best ways to do this just got a tiny bit better. The Zanden Model 5000 Mk IV is still one of the very best DACs you can buy -- still a Reviewers' Choice.